It was G-R-E-A-T while it lasted. What do these 3 have in common besides the fact that they have worn a Boston uniform ? Not much, it might seem at first. The 36-year-old Lowell is a .280/23/98 guy with 1 GG, 4 ASG’s, 1 WS MVP and two Championships. He beat cancer. He is loved & respected in the clubhouse. He attended Florida International. Jason Bay, 31 years old, is a .280/33/107 guy with 1 ROY, 3 ASG’s, and no championships. He lends credence to the idea that Canadians are just plain nice people, especially to the fans and media. Jason went to Gonzaga. 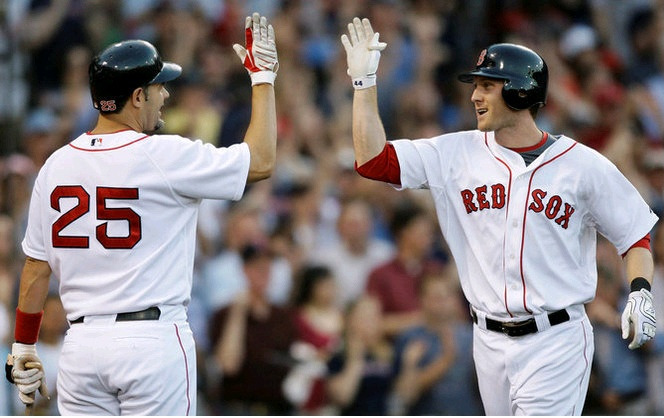 Craig Breslow, 29, is a lefty reliever who projects to 68 relief appearances with a 2.79 ERA. He has had 4 good years playing for 5 different teams. He pitches with guile. He is loquacious. He graduated from Yale. One thing that all 3 have in common is that they are not what you would call “one of the Red Sox boys”. They are not organization players. Lowell was the millstone around Josh Beckett’s neck when he arrived in Boston in the Hanley Ramirez trade. Jason Bay was the hard hitting stop-gap measure that filled leftfield when Manny Ramirez was sent packing to Los Angeles. Craig Breslow was picked up as a spare part for a befuddled bullpen in 2006, a year in which the Sox missed the playoffs. When the Sox let Breslow get away, they said goodbye to one smart kid. Mr. Breslow graduated from Yale with a degree in molecular biophysics and biochemistry before turning pro. Being a Connecticut native like Breslow, I rooted for him to catch on with Boston. He was good for a while, and less of a mystery the more he pitched. Still, he soon persevered and progressed in Cleveland, Minnesota & Oakland. Clearly, Jason Bay isn’t one of their guys, either. The Sox didn’t give Bay and his agent a clear indication that it was time to accept their $60 Million or move on. They made that decision, kept it to themselves and moved onto to Mike Cameron, leaving Bay alone with the Mets on the dance floor. There have been more than a few whispers around Boston this winter that Mike Lowell will surely be productive next season, wherever he is, but something is missing from Lowell’s relationship with the Sox, some favorable predisposition between front office and player, like the one Manny DelCarmen enjoys. It is the absence of good feelings that persuades the Sox that it is OK to eat $9 Million of Mike’s $12 Million salary just to be rid of him, as when they tried and failed to arrange in a deal with Texas for Max Ramirez. (Max happens to project to .217, 19, 86 in a full season he would likely not get to play behind V-Mart & Tek, by the way.). Mike Lowell just isn’t one of the Red Sox “guys”. David Ortiz is, of course. Mike Lowell would be more productive bat in the DH slot than Big Papi. But that’s not the way you make out the lineup card if you have made Ortiz the face of the franchise and publicly given him a trophy anointing him as The Greatest Clutch Hitter in Red Sox History. I project David at .249, 19, 75 next year if he stays healthy. He’ll strike out more than he ever has — on 27% or 28% of his official at bats — as he continues to slow down. If he does better than that, I’ll wonder what he’s been putting in his nutrition shakes. Bay, Lowell and Breslow have not gotten the benefit of being one of the guys, like Mr. DelCarmen. Manny D. has his supporters in Red Sox Nation. He’s big, he throws hard, and when he has a good inning he’ll get a ground ball and strike out two with a mid-90’s fastball. But Manny has stretches when he allows 40% of inherited runners to score. His ERA for September was an ungodly16.20. He is 54% more likely to yield a hit or a walk than to K a batter. He’s had some very bad Sundays, which makes one wonder how he is spending his Saturday nights. A lot of teams have been interested in the hard throwing DelCarmen, but he’s one of the guys, and as such is sticking w the Red Sox. I only wish the front office valued Lowell & Bay as much as they esteem this kid. It’s good to be one of the guys. This Lefty is just getting started. It was Jason Bay Day. His First Day of Issue as a Red Sox Rock Star. Let’s have a hearty welcome for This Lion of British Columbia. This Gonzagian. This Cape Cod Leaguer. The Man Who Really Makes It The Bay State. He was greeted warmly on his first day at Fenway, while Manny was dragged through the dirt. Mark, the life-long, 50-something lifetime Sox fan from Springfield leaned forward in his chair at O’Learys and said, “The bottom line is that Manny makes $20 Million per year and should act like he wants to play the game. Period.” Mark is a reserved person, with a serene quality that’s appropriate for a thinker, designer, architect, all of which he is. His wife, Sue was exhausted from walking in Boston’s toxic humidity on this blue sky & sunny day, Jason Bay’s First Day. Sue was running on empty, had said little from her perch on O’Leary’s oak chair. But the Manny discussion roused her. “That’s right ! He should just shut up and play !”. Nothing raises the emotions of educated & proper New Englanders like being abandoned by the object of their love. You heard about Casper Milktoast, the mild mannered Dentist from Everett who drilled his lover’s eyeballs out of their sockets after learning that girlfriend had been trysting in wine country ? Same thing. Exact same thing. Content and in love one minute. Out of sorts the next. Such was life with our Manny. 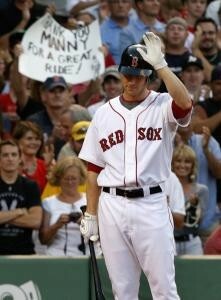 On this day, Fri., August 1, Jason Bay Day, there was a lovely ballgame. Played first under a stunning blue sky, then under warm and gleaming Fenway lights, it was a classic. A tale of few runs, stranded runners, stalwart pitchers, and minor details. Hey ! Did anyone notice that the bedrock in the bleachers has been sandblasted and sealed ? Gone are the mustard stains of 1973, when Yastrzemski hit the wall and I dropped my hot dog. And the bleacher seats in section 43 are ALL NEW. A little wider than the old model, smooth and supple. I pity those poor bastards squeezed into the tight blue wood grandstand seats that saw Ted Williams play. On Jason Bay Day, BoSox Ace Tim Wakefield mixed his variable-speed knuckler with a curve and a not-so-fast fastball ball. 37,832 watched Wake strike out, ground out and pop up the A’s with ease. Then he put two men on in the top of the 7th, when the other Manny, he of South Boston, came in to finish. It was Wake’s 16th Quality Start. He leads the starting staff in these. Tim has delivered a QS in 70% of his mound appearances. Which also leads the team. Justin Duchscherer, who the Sox once traded to get Doug Mirabelli, was equal to Wakefield. He gave up one run over six easy innings, stranding 7 Red Sox runners. 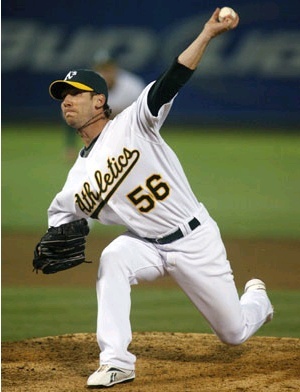 He was masterful, although he did hit Jason Bay with a pitch on Jason Bay day. Jason entered the Rock Star strata during the lineup announcement, when his name was met with lusty cheering. That emotion was heard again repeatedly when he made a sliding catch, a running catch, walked, was HBP, tripled in the 12th. Bay scored the only two Red Sox runs of the game, the second of which ended the game when he crossed home plate on Jed Lowrie’s chopper single. Every time he stepped on the field, every time his name was mentioned, the love & cheers of thousands poured out into this peaceful, harmonious night. He took a ball. Cheers ! He took a strike. Bullsheet ! He is hit by a pitch. AWLLRIGHTJASON,WAYTOGETHIM ! The A’s were vanquished in the 12th when Bay tripled and Lowrie drove him in. But the defeat of the night occurred when two small boys walked down the bleacher stairs of sec. 43, side-by-side, rope in hand, dragging the jersey of Manny Ramirez, former Red Sox player, over the sandblasted bedrock, through the recently deposited dirt and spit and kettle corn of the Fenway Park bleachers. And that was a poignant comment. What ? You didn’t like playing for us here in Boston ? You made $20 Million a year and won two World Championships while we held you in our heart, cherishing your cartoonish child-like nature as much as your freakish hitting ability ? You couldn’t make that work ? Well, screw you Manny Ramirez. You broke our hearts. Screw you, and the Dodgers, too. We don’t need you. No siree, not on this peaceful, harmonious night. Ever the marketing savants, the Sox offered Jason Bay Jersey T-Shirts for sale. They sold DOZENS on Jason Bay Day.